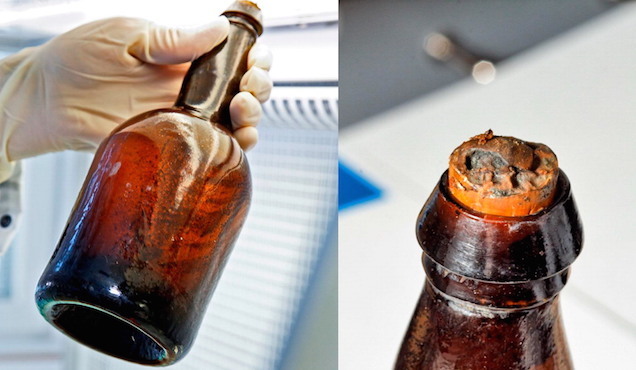 Back in 2010, some archaeologists investigating a 19th century Baltic Sea shipwreck found something more unusual than treasure in the ship’s cargo – four beer bottles fully intact, with the brew still sealed inside. The amber ale was likely brewed in Belgium back in the 1840s, and was on its way to ports in Scandinavia. You might wonder how well it held up, but surprisingly not too badly for being nearly two centuries old. “These bacteria were still alive,” said Brian Gibson, a senior scientist from the VTT Technical Research Centre in Espoo, Finland, not far from where the bottles were discovered. While beer has been around for at least 7,000 years, being brewed by the ancient Mesopotamians in Iraq, and many breweries have worked to recreate beers from the Middle Ages and American colonial era, Gibson believes this batch is likely the oldest bottle of beer in the world that’s still intact. Gibson and his colleagues from the University of Munich did an in-depth chemical and microbiological analysis of the beer recently, publishing their work this week in the Journal of Agriculture and Food Chemistry. Despite the inevitable contamination from salt water, they were able to learn quite a bit about the processes of mid-19th century brewing. Shortly after their retrieval from under the sea, the discovery was celebrated with a monumental beer tasting, consisting of beer experts throughout Finland who came to sample the 170-year-old brew. Rather than using a novelty talking bottle opener, they inserted a thin needle through the cork, taking their samples from two different bottles, in order to avoid exposing the contents to open air. However, the taste testing ended up being something of a disappointment in the end. The researchers described the ancient beer’s scent fairly vividly in their paper, as a cross between “autolyzed yeast, dimethyl sulfide, Bakelite, burnt rubber, over-ripe cheese, and goat with phenolic and sulfery notes.” During its time under the sea, water leaked through the cork of the bottle, rendering the contents about 30 percent salt water. Therefore, Gibson and his team had to rely on a further chemical analysis to be taken on the sugars that remained, as well as the alcoholic compounds in order to get a better idea of how the beer was made – their primary interest being the practice of pre-Industrial distilleries. In comparison to modern day craft brews, Gibson said their batch was similar to an amber or lambic style ale, which are normally brewed with wild hops. One of the beers had a fairly pronounced hops flavor, while the other likely had more of a fruit flavor, similar to modern summer beers. In many ways, the ingredients in the beers were fairly similar to modern ones, although it was likely that 19th century beer was much more sour, as they did not have a way of keeping acid-producing bacteria from the brew during fermentation. Sam Calagione, who is the founder and president of Dogfish Head brewery in Milton, Del., has already shown great intrigue in their finds, as his company has worked to recreate historic beers since 1998 with recipes obtained from archaeological digs. Dogfish’s “Midas Touch,” named for the fabled Greek king, was based on a jar found in a 2,700-year-old tomb uncovered in Turkey, a Bronze Age drink made from barley, saffron and white muscat grapes. Stallhagen Brewery of the Aaland Islands in Finland has recently imitated the Baltic Sea beer, under the label “1843.” In addition to the beer bottles, the divers also found 150 bottles of champagne in the wreckage.